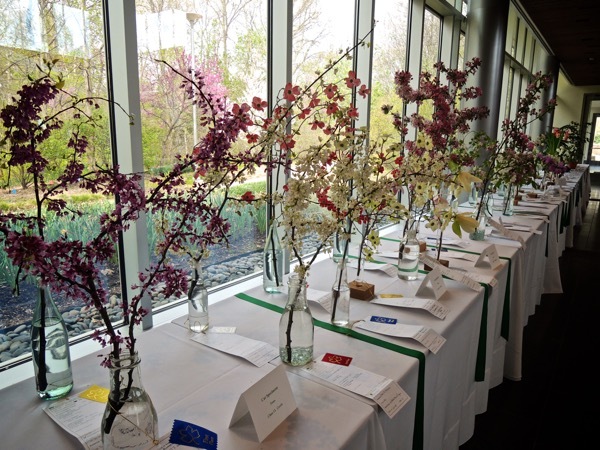 This spring I have been traveling non-stop judging flower shows for the Garden Club of America. While my expertise is in the photography division I delight in seeing how the national floral arrangers interpret and execute their themes. I marvel at their creativity and expertise because for me a centerpiece needs to be as simple as one-two-three. One thing I’ve gleaned from viewing numerous exhibits is that the human eye is attracted to odd numbers. That means three, five, seven tend to captivate. 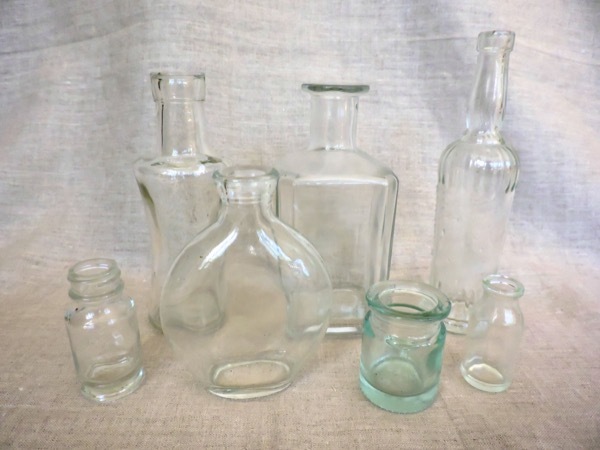 At a flower show the horticulture specimens to be judged are often placed in clear bottles. While they are obviously individual entries I think they look lovely massed together. A little trick of the trade- a good hort judge is always on the hunt for pleasingly shaped bottles for their specimens, raising recycling to an aesthetic level. 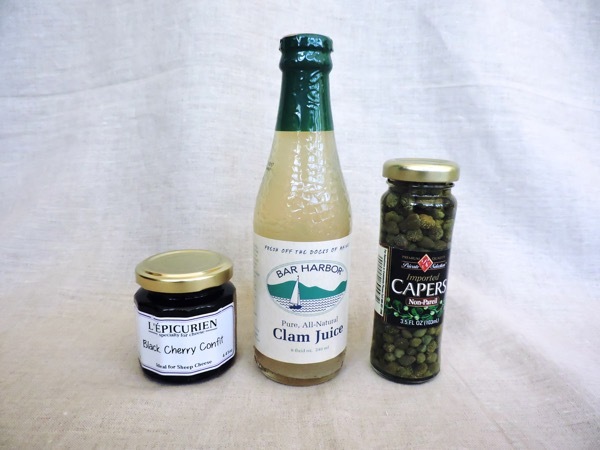 I’ve started my own collection of jam, caper and relish jars. 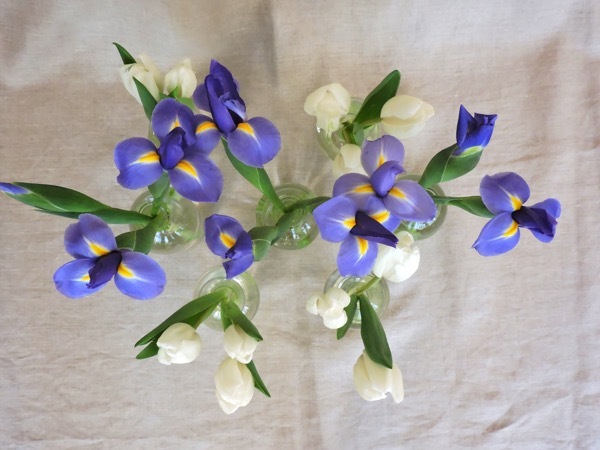 Perfect for a last minute hostess-gift bouquet or a bedside arrangement. 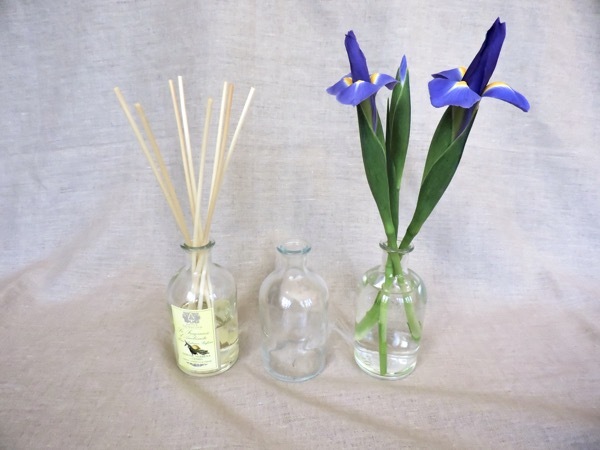 My favorite containers by far are my home fragrance diffuser bottles. Once thoroughly cleaned they make a striking bud vase. Years ago I ordered a dozen two-inch bud vases that I could put at each place settings. One of the best things about Trader Joe’s this time of year is their endless display of spring bulbs. 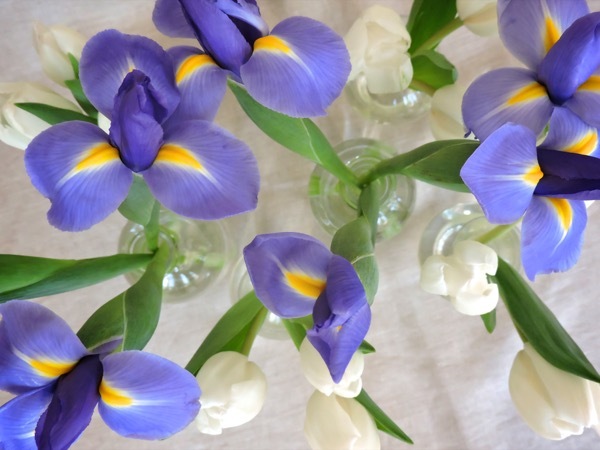 Bunches of iris and cut tulips for mere dollars. I love making small bouquets and putting them around the house. I’ve also discovered that together they make an intriguing centerpiece for my dining room table, and the best part is it takes only minutes to make. 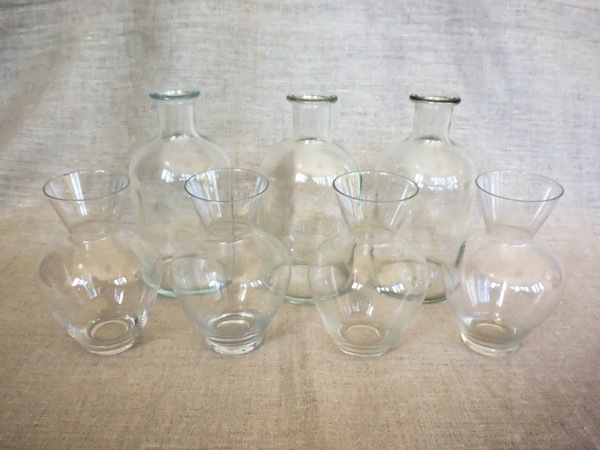 For this centerpiece you will need three tall bud vases and four short bud vases (note that the total number is seven, an odd number). 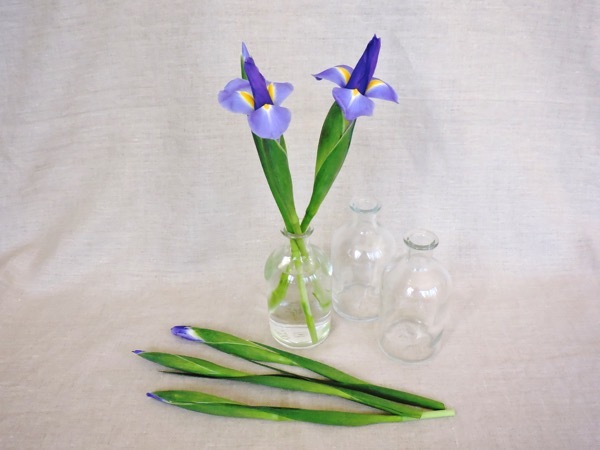 For each of the tall bud vases you will need three iris stems (for a total of 9 stems). 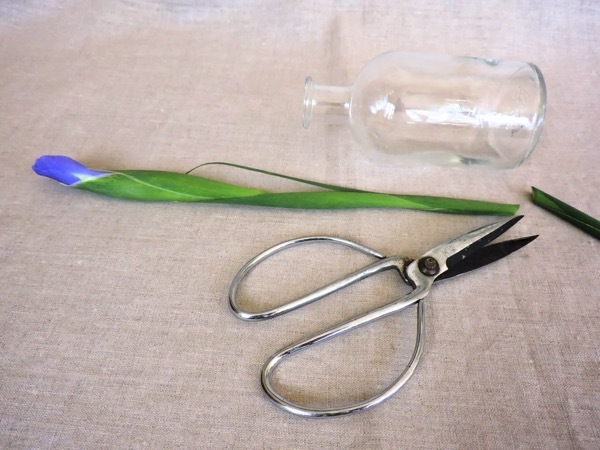 Trim each so the top of the bloom is approximately four inches above the top of the vase. It is critical that the overall height of any arrangement for a dining table not obstruct the potential views of your guests from one another. Repeat with each of the tall bud vases filled with cool water. 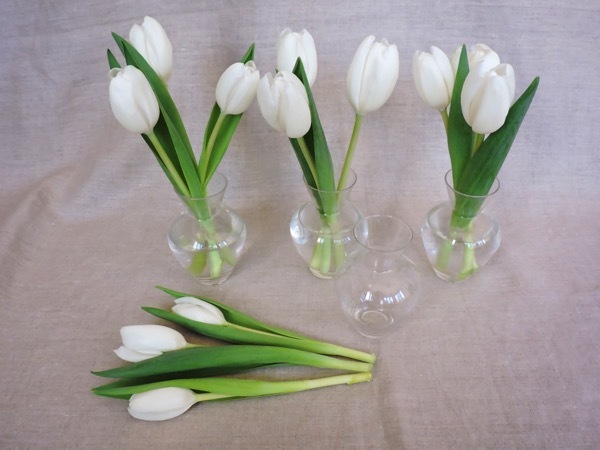 For each of the short bud vases you will need three tulips (for a total of 12 tulips). 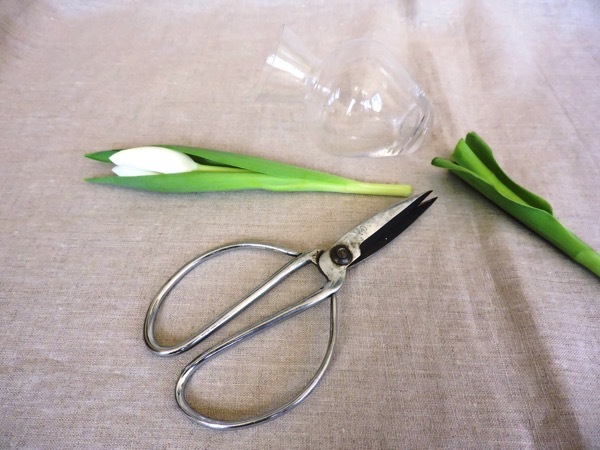 Trim each so the top of the bloom is approximately three inches above the top of the vase. 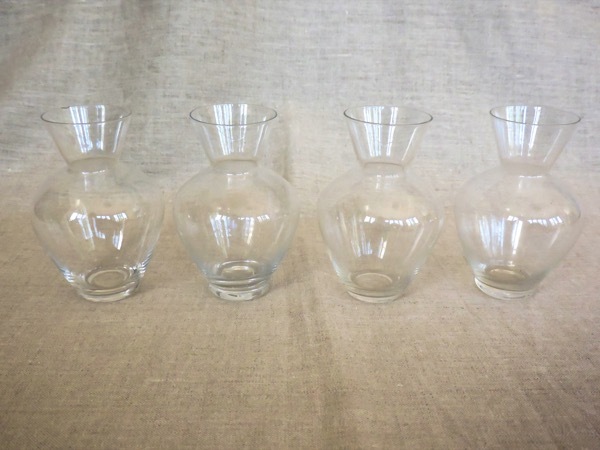 Repeat with each of the small bud vases filled with cool water. 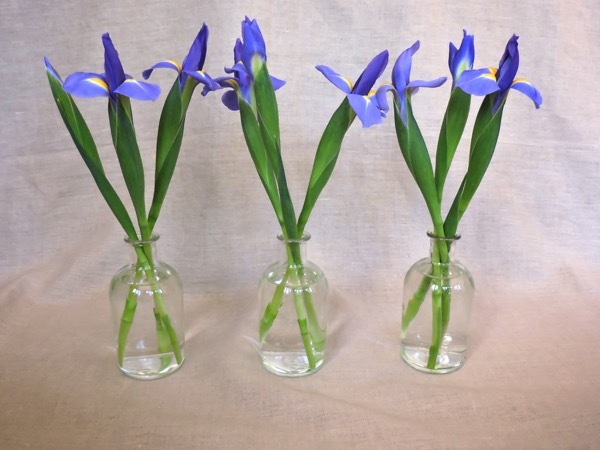 To construct the centerpiece place the three iris filled vases in a straight line down the center of your table approximately 2-4 inches apart. 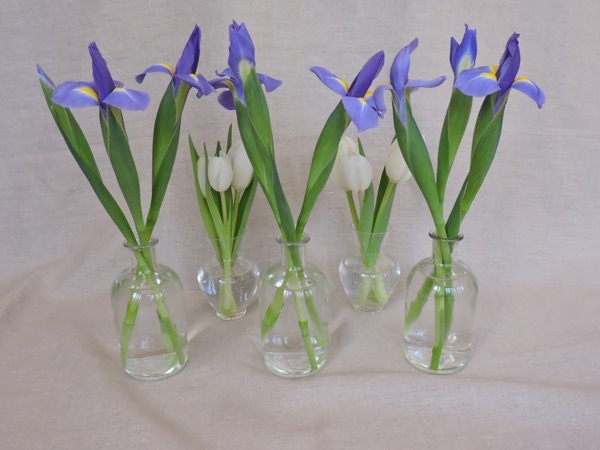 Then place two of the small bud vases filled with tulips in between the openings on one side of the iris filled vases. 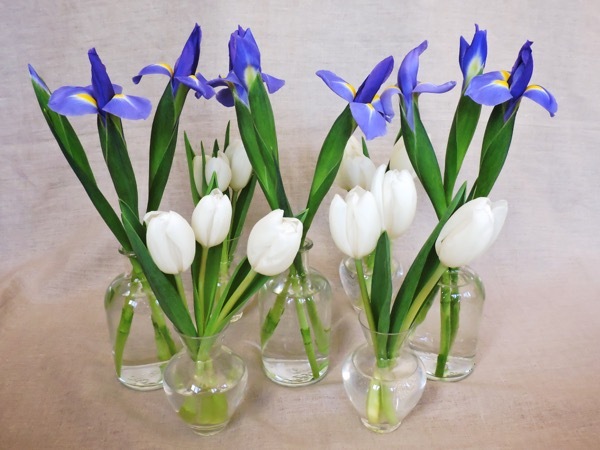 Repeat on the other side with the remaining tulip filled vases. As seen from above the overall arrangement should gently weave in and out. 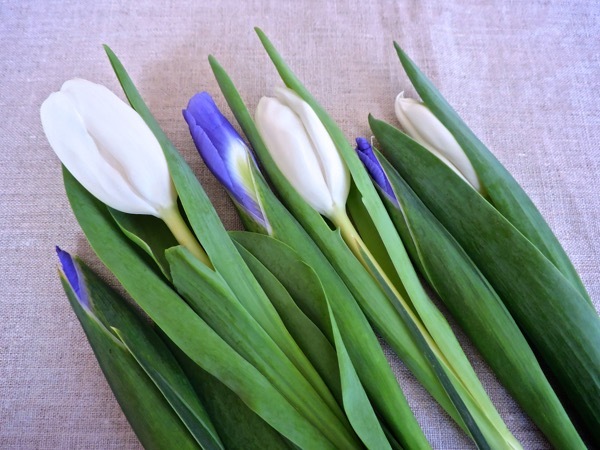 This simple spring line-up is sure to win a blue ribbon at your next dinner party!